Coming from a strictly relational db world, NoSql style databases have always seemed a bit scary! 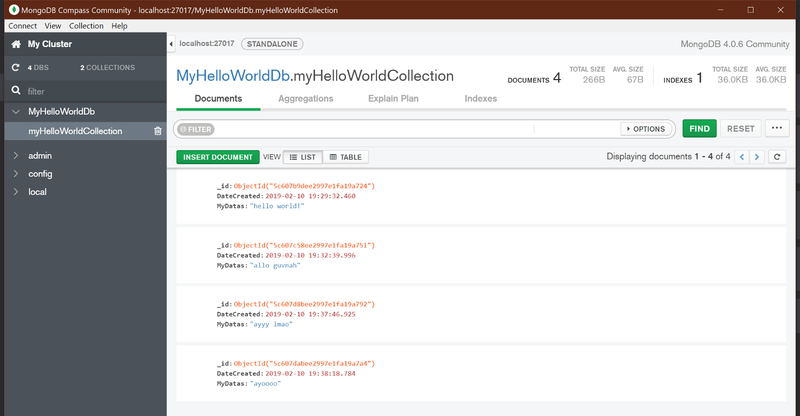 I recently had the opportunity to play around with MongoDb for the first time, and I was quite surprised by how easy it was to get started! A NoSQL (originally referring to “non SQL” or “non relational”) database provides a mechanism for storage and retrieval of data that is modeled in means other than the tabular relations used in relational databases. Such databases have existed since the late 1960s, but did not obtain the “NoSQL” moniker until a surge of popularity in the early 21st century, triggered by the needs of Web 2.0 companies.NoSQL databases are increasingly used in big data and real-time web applications. NoSQL systems are also sometimes called “Not only SQL” to emphasize that they may support SQL-like query languages, or sit alongside SQL database in a polyglot persistence architecture. Traditionally with relational databases you strive for as normalized of data as possible; tables with foreign key relationships more or less. With a NoSql database, it seems like doing a lot of that “design” around keeping your data structure is not as necessary — in a lot of situations you can simply get away with storing the entirety of the object in a single document. Honestly, I don’t know much at all about NoSql style databases. I knew I had a potentially massive amount of varying “schema” json objects that I needed to store, and I needed to figure out a way to do it quickly. MongoDb is something I’ve heard of, as well as a few others that were thrown out: Cassandra, Raven, Redis, Couch, etc. A few of these were out of reach immediately, as it seemed that they were only available on linux — at least at a cursory look. Others it was difficult to find information or packages that would interface with .net core. MongoDb luckily has a community addition, installs on windows, and a .net standard based NuGet package that can be used with .net core — sold! So now that that the database is installed, we can now proceed onto the traditional hello world application when poking around something new! Now all that is left is to write a bit of c# code to try out MongoDb! // Using an empty filter so that everything is considered in the filter. Now that we’ve inserted data, we can query that data using c#, or take a look at it with some of the mongo tools that came with the installation — like the mongo shell or compass. From the above you can see the documents we’ve inserted via the console application are present, and that they exist in a database and collection that was created automatically via the code. Hopefully the above helps show that it’s quite simple to get started playing around with MongoDb. Note that the above does not look at any security related concerns, so make sure to take that into account if you’re moving forward with MongoDb. I’ve been working with a relational database for so long that NoSql seemed pretty intimidating, but getting started with it was a lot easier than I expected!